Nashville may be known as the birthplace of country music and the home of honky tonks and boot-scooting, but even a quick visit to the area will demonstrate that there’s so much more to be discovered and enjoyed. With a booming job market, an exciting craft brewery scene and an ever-growing list of hot new restaurants to try, tons of amazing (and often free!) opportunities to enjoy live music, and gorgeous open spaces for playing, hiking and exploring, the Nashville area is the perfect place to establish your new home. It’s a rapidly growing city where locals and transplants alike welcome newcomers. It’s a place to settle, a place where you can put down roots and a place that will keep you hoppin’ with plenty to do. Ready to make the move? Not sure where to begin? Here are some things you should know. Davidson and Williamson counties are home to a huge number of both private and public school options. If you’re leaning toward sending your child to a private school you can send him to a prestigious college prep academy with 150 years of history, a Montessori school located on 10 wooded acres, or a multitude of other schools all along the educational philosophy spectrum. Williamson County (just south of Nashville) public schools boast some of the top-rated schools in the state. And Metro Nashville Public Schools, a district of over 160 schools, offers school option lotteries, the Academies of Nashville program which has been recognized by the White House as a national high school transformation model, and dedicated, talented faculty, including Tennessee’s Teacher of the Year. This Zone Finder can help you navigate Metro’s large area and focus in on zoned schools and communities you may want to join. It’s no secret that the cost of living in many California cities is significantly higher than in much of the country. Whereas LA’s cost of living ranks 43% higher than the national average and San Francisco’s cost of living scores a whopping 80% higher, Nashville and its surrounding areas boast a cost of living 3% lower than the national average. In addition, Tennessee has no income tax and some of the lowest property taxes in the country. 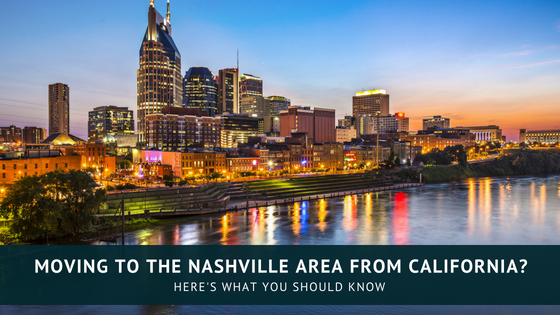 When looking for a home in Nashville, you’ll be getting a bigger bang for your buck with a median home price of $252,800, compared to CA’s median home price of $542,900. With new homes being built and arriving on the market every day, Nashville’s real estate scene is hopping. Wondering about some of the best neighborhoods to look at? Check out this guide for info on Nashville’s urban and walkable neighborhoods. Looking for a place outside the city? You’ll find plenty of options in Bellevue, Brentwood, Franklin, Donelson, and more. Whether you’re looking for a condo in the heart of downtown, a family home tucked in a walkable neighborhood, or something with more of a sprawling country feel to it, you’ll find it all in the Nashville area. Nashville’s climate, like much of the southeastern United States, is classified as humid subtropical. This translates to four beautiful seasons, with winters typically on the short and mild side and summers often long and warm. Nashville tends to have elevated humidity throughout the year and receives plenty of rain from January-December. While winter can seem a bit brown and gray at times, sunshine is never long in coming and the beautiful, temperate spring and autumn, with their flowers in riotous bloom and their trees in brightly hued splendor, more than make up for winter’s lack of color. All of that rain contributes to Nashville’s extensive green spaces and natural beauty. Located in the north central region of Tennessee, it offers easy access to rolling hills, is centrally located among dozens of waterfalls, and is just a few hours’ drive from the Great Smoky Mountains. The Nashville area itself boasts amazing hiking, including over 3000 acres of hiking, biking, and horse riding trails just nine miles outside of the heart of downtown. The Cumberland River snakes through the eastern part of the city, providing a beautiful river walkway for biking and strolling. And Centennial Park, in the heart of Nashville, boasts open green spaces, a small lake, walking trails and a replica of the Parthenon, as well as a free outdoor concert venue known as Musician’s Corner. Nashville and its surrounding areas are home to some incredible food and drink - check out Biscuit Love for brunch, Prince’s Hot Chicken Shack for the city’s iconic dish, Husk for the south’s best fine dining, and Diskin Cider and Tailgate Brewery for a small taste of the city’s thriving craft brewing scene. It’s also home to one of the best live music scenes you can find - and not just country music, but countless independent and well-known artists in all musical genres. Need a hometown sports team to cheer for? Nashville’s got you covered. Looking for a hip art scene? Check out the First Saturday Art Crawl. You’ll never run out of things to do in Nashville. I have helped dozens of people relocated from California and I would love an opportunity to help you.